Amami Haruka Cosplay- "No one is truly free"
Second video: great work there. Like the opening and ending too. LOL!! That's why you train and do lessons!! It has been really fun guys. Enjoy it's special opening and ending!! Ehhhhhhhhhh what do you mean your last video? Are you taking a season off for sabbatical or retiring from the world of showbiz or something? Did you injure yourself...? Oh dojikko-chan, the true artists are those who endure true pain for their passion! ... A bellybutton! How scandalous! The hand moves are complex! I haven't played the games directly but I would guess the ending was inspired by a similar style from a later point in the gameplay? Little Match Girl has some difficult foot work so I changed into Rough Time School costume that I bought so I wouldn't have to dance in the heavy boots. 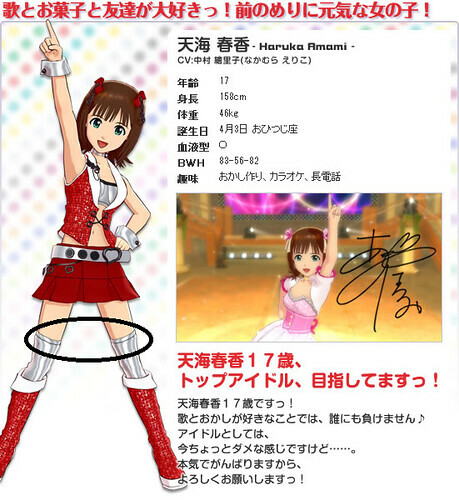 Hmm...Haruka-chan hasn't had her farewell concert like in boxm@s yet so perhaps I'll spin something out for you guys. Edit:　Oh I practiced falling before the video, no idols were hurt in the making of the video! One thing to note too in your LMG I really like how you not only used your feet and hands but your core muscles as well although LMG requires you to use your hips It is still one thing I've seen other people tend to overlook. kaeru-P, arigato for all your feedback!! Megare is an awkward dance and I was so surprised it won. I think it looks much better with more people. ^^;; And yes, it's very hard to dance in boots. Thanks for the feedback on Little Match Girl, I sort of have balance issues, so creating a tight core will keep you upright in some of those moves of Little Match Girl!! ^^;; I always feel like I'm going to fall over!! Haruka needs core training stat!! And thank you again for noting my aim to capture Haruka's disposition! Hey guys. A little update. I don't know if anyone could tell since I'm so sneaky...but I sewed the socks wrong when I made them the first time. (I sewed them on the wrong grain so they were stretchy up and down and not side to side) Thus they were only as long as enough to fit into my boots about 3 cm in. They were short!! So really, the socks were a pathetic facade and unfortunately, they would not fit my legs at all. So I used socks glue...that stuff Japanese school girls use to glue their loose socks to their legs and prevent it from falling down. Problem? The residue is disgusting and got on the socks and my leg and I had to throw the socks away. Solution: Make new ones. Here's my progress. 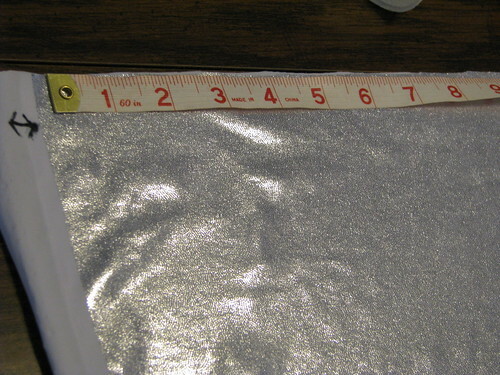 Step 1: Haruka helps me find the stretch and I mark it on the side of the fabric so I don't forget this time. Thankfully, though, it is stretchy both ways which I find out later. Step 2: I measure my thigh diameter divide it by two and take off a few inches because of the stretch. I want them to fit tightly!! 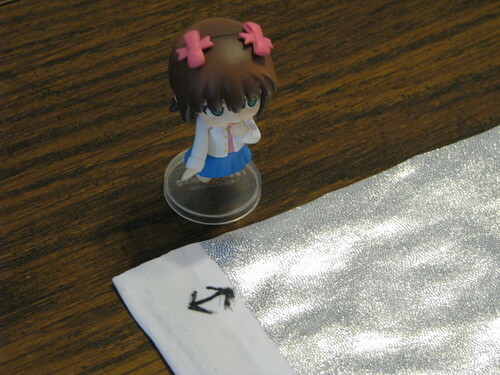 Step 3: After the fabric is cut, I pin the two pieces together, face side in, with Haruka's help. 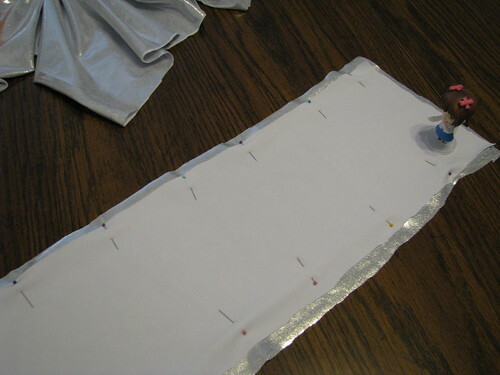 Step 4: Time to sew the two pieces together. 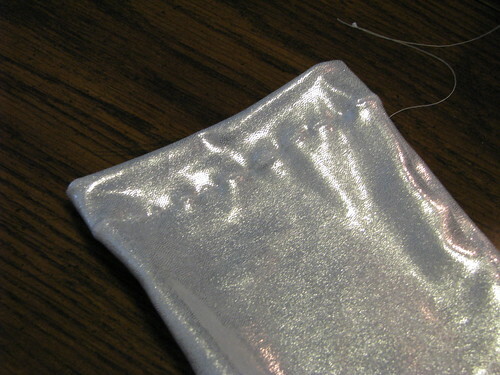 Step 5: Cutting the seam allowance to allow the seams to lay flat. 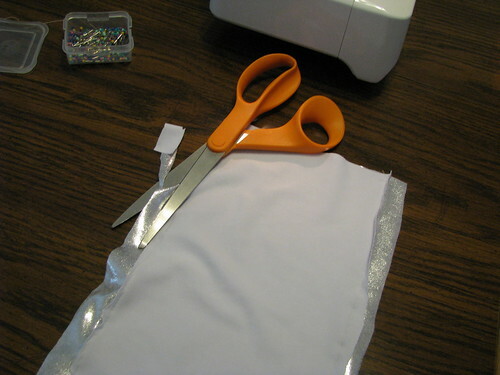 Hemming it will serve three purposes. B) It will make it a wee bit tighter on my leg, which is good. 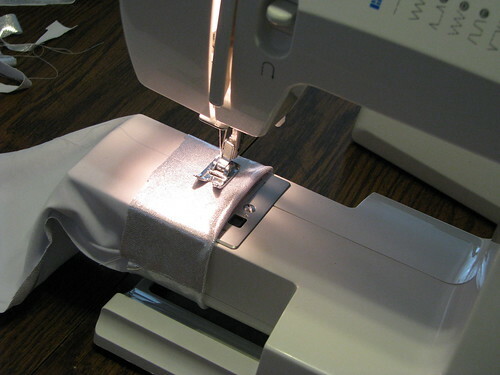 Step 7: I use the free arm on my sewing machine to hem. Finished hem is not too visible. 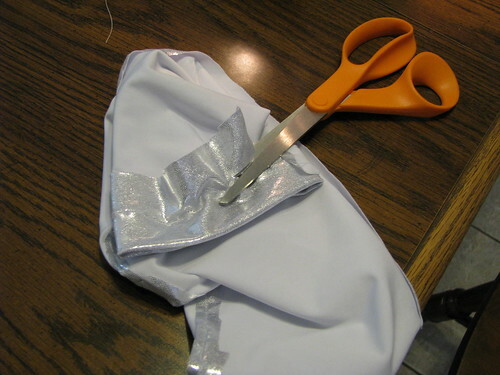 Step 8: Cutting the excess fabric again. I was a little worried there. 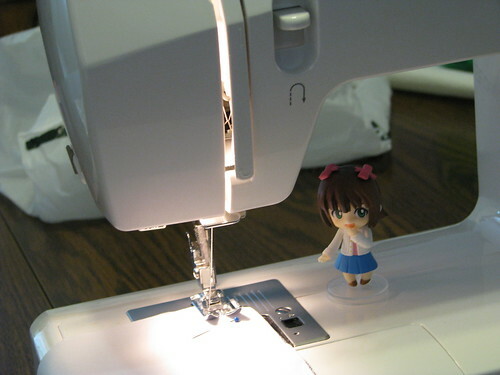 Mini-Haruka didn't seem to be pitching in much with sewing the first one. It's all good though, she got her act together and contributed to the second. She may be dressed casually... but an idol's work is never done. I didn't notice the outfit shortcut in your videos, so the sock glue did the trick for sure. I don't much like how it sticks either... though I've never had to wear it for a practical reason for any period of time. I was a bit curious if the fabric was stretchy or not, as most of that glossy type I've run across doesn't give much (and doesn't seem like it'd breathe either). Neat you found something that worked and handled well. Granted... I don't do much fabric shopping myself. Thanks for the run-down of how ya did it, always interesting to see it bit by bit. Your Singer seems a bit fancier than what I'm familiar with, but they do make some groovy machines. Your dedication is never-ending and it's awesome to see out of a cosplayer. Huh, I never thought about fabric having a grain. The more you know. They probably talk about stuff like this at the cosplay panels at the local con, but I never attend those. 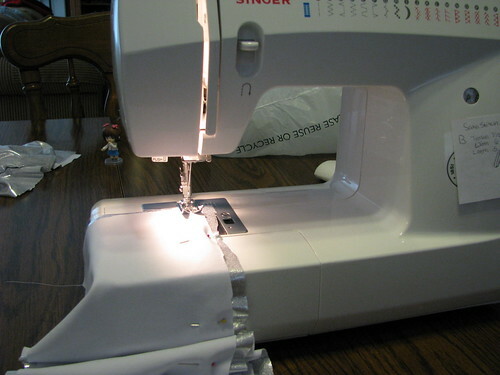 I haven't touched a sewing machine since middle school classes. I'm afraid of sewing my hands together. Now you know...and knowing is half the battle!! Well you can never know what you can do until you try!! At the con we're going to have a special photoshoot so look forward to it! Etto~ No offense but has this Producer-san considered shaving or trimming his beard to look more like the Producer? Or wearing a toupee? He's already got the dopey look down pat but his pants seem a bit loose and his suit is a little too short in the sleeves. I'm not good at cosplay or anything but these are just some ideas that came to mind is all. A super-cute Haruka deserves a stylish and handsome Producer deshou? I'm still confused about this leg cloth glue thing you had written about earlier... it's baffling, I'd never heard of anything like it before... gluing clothing on to the wearer? I like his suit, he's wearin' it loose and ready to produce! The tie is on the money... be it yen or USD. How about giving him an iconic P somewhere, even written on the convention nametag would be groovy? I approve of the facial hair, as not all Ps are cut from the same cloth! Yar... difficult to think up poses for big P, but whatever you two think up will be quite awesome. Just make sure you get at least one where it's as if he gave you a bad Morning Communication comment. Haruka is hilarious when she throws her arms back in frustration. Good luck and have fun at the convention!